If you take the life lie from an average man, you take away his happiness as well. Not that Lance Armstrong is an average man, by all means he's not, but I'm sure you get where I'm heading. Before writing this post I had a couple of days of thinking. Not on the facts and how they play along. Work got in the way and frankly I also wanted to get a post like this heading somewhere. After all, despite what fanboys and girls on his side claim, this is big. Despite what the lack of spine among some riders, managers and industry people tell, this is the biggest fraud in the history of sports. That's why it matters. Not that some of the evidence is fourteen years old and that Armstrong is a retired athlete, this goes into the core of what sports is and how it should be. That is why it is important to me. I won't play the "I'm-so-disappointed-card" because I'm not. Some have expressed that this is bad for cycling, among them are Tom Boonen and Lars Bak whom I watched yesterday stateed this in addition to several others on twitter. I disagree. The case has made it quite clear what the problem is, and it is not the riders. The way the UCI has exposed themselves, their governing capabilities and intentions during this case have been both tragic and somewhat entertaining. Why? Because the rest of the world is paying attention. I have been wondering if the best thing for cycling would be if the IOC threw cycling out of the Olympics. That way, the different national federations would "wake up and smell the coffee". On the other hand, such a move would mean organisations like USADA wouldn't have jurisdiction, which isn't a good idea. Anti-doping work need to be impartial, period. Speaking of USADA, I am a bit confused and anxious reading that so many from the US seem to want the organisation to disappear. To me, the cornerstone of a sports organisation is excactly the impartial work an organisation like USADA does. If there was a SPOTY in the US, my vote (if I had one) would go to Travis Tygart and his crew. When US Attorney Andre Birotte closed the fed investigation of Armstrong, I was upset. Why on earth would he do that? No matter whose side you're on, a thorough investigation would, in my opinion, be an end to this case once and for all. But no. So when I heard that the USADA picked up the glove and got hold of the overwhelming evidence, I looked upon this with great interest. US Cycling sided with the UCI, not surprisingly. Take a look at the flow chart at Cyclismas to get an understanding of the links. As the UCI continues to make an utter bad impression regarding their top management capability to govern, I'm eager to find out what ASO is up to and their thoughts on the matter. Lance Armstrong is, besides being an outstanding gifted athlete, also a very good businessman. I got nothing against a guy making a lot of money on his own. Basing it on fake results is an entirely different case. Today a leading newspaper in Norway, www.vg.no claimed Armstrong has made more than $100 million over the years, in addition to owning/leasing a private jet and valuable property. Add a very solid network of powerful people from business to politics. Some are trying to dissociate themselves from him as much they can, whilst others seem to be sticking with their fallen hero. News says that Livestrong donations went from $3k per day to $78k following the controversy from last week. Just as Armstrong has been trying to do, duck and divert the news about his doping into a public cancer-awareness campaign, as he has done repeatedly with luck the recent years, this however, is not a fight about who does what to/against cancer. It's about the biggest fraud in the history of sports. The fact that Armstrong spent some of his earned money to set up a foundation to help awareness is a good thing. Several thousand people voluntarily work for Livestrong giving help to people who need it is great, no matter how cynical its boss is. Just as cycling is bigger than Armstrong, the "fight" against cancer most definitely is too. Despite his attempt of trying to make people believe otherwise getting people emotionally attached to him and his story. His story is great, I was inspired by him once. But this is not about cancer, this is about something else. Armstrong's way of getting his way is well known to people familiar with cycling. What I find the worst in his statement as he "turn the page", is this: "At every turn, USADA has played the role of a bully, threatening everyone in its way and challenging the good faith of anyone who questions its methods and motives (...)". I almost don't know where to start. Armstrong himself is considered a bully himself and one of his methods for getting at his critics, it is excactly acting like one. Ask Betty and Frankie Andreu, who allegdely witnessed Armstrong confess to doctors on the 29th of Oct 1996 using PEDs how they felt during the years. Ask Simeoni and Bassons who were literally bullied out of the peloton (ask their wifes and families too while you're at it, who lost one of the households income). Ask Tyler Hamilton about the episode at CacheCache and ask Greg Lemond what happened to his bikecompany after he called out to Armstrong. Ask Emma O'Reilly who once was Armstrong's masseuse. Ask David Walsh and Paul Kimmage. The list goes on and on. I wonder if Armstrong, like several other sports icons, thinks that regular laws don't apply to him. Armstrong claiming that there are no physical evidence of him doping might be true. But as many statements from Armstrong during the years, it's just halfway true. What is a physical evidence? A test? We know Barry Bonds didn't fail one, Marion Jones didn't fail 160 (!) tests until she confessed lying to federal investigators and fans in tears. So it couldn't have been difficult dodging tests then? The AFLD even claims Armstrong was tipped off before tests, more among the excellent work by Shane Stokes over at Velonation, here. Testemonies from those surrounding him who witnessed the crimes year after year should be sufficiant. Whether you have a romantic view on sports, like I do, or are a full time cynic, I don't know. To me sports is about equal terms. No matter your background, race, political standpoint and gender, you meet and compete against others. Now there will always be development and athletes searching for the upper hand. That is usually fine as society needs to evolve to move forward. The marginal gain-philosophy is also fine with some limitations. That's why we have rules and organisations are put in place to govern. I don't want some teams with unlimited budgets being able to sport 5,6 kg bikes while other can't afford bikes weighing less than 7,9 kg. To me ethics and framework within sports are chrystal clear and vital for a sport to function. It is as simple as that. Chemistry in sports can and must never ever set the premise for who will win. The effects of someone cheating runs deep, and I can only imagine the amount of people effected negatively by it. People close to the doper, family, teammates and their family, staff and so forth. Not to mention the competitors who were deprived a possibility which in return affected their family again. Despite what Armstrong says in his statement "the same courses, the same rules", it doesn't make it right if everybody is doing it. Just as one cannot face the mirror and say that it was okay to bully a classmate just because everyone else did. It doesn't make it right, ever. I understand times were different then compared to now, but that was then, this is now. As USADA have overwhelming evidence including more than 10 witnesses, some of the teammates and Armstrong's friends, claiming they saw Armstrong dope, a physical evidence doesn't matter. The same goes for other cases tried before the court, not related to sports. Some of the alleged witnesses have even admitting to doping themselves, stepped forward and taking responsibility. Cycling is bigger than Lance Armstrong, much bigger. Yes, the cases are old but he and others surrounding him are taking advantage of his cheating yet today, making millions of dollars. The message is clear, no matter how big star you are, what you did was wrong and letting that go by unnoticed just because some of the incidents happened 15 years ago is not right. Remember, according to USADA, some of the incidents are just a few years old. Many say Armstrong quitting was an admission to guilt. I tend to degree as this is the closest thing to admit guilt we'll see from Armstrong. I just hope that this case now can be closed and cycling can move on. The evicence will come out as the cases of Bruyneel and others still are ongoing. We will see what steps Armstrong takes if this happens, but there is no doubt that his all American hero-status has taken a blow. Far to big for him to recover from and the number of powerful people seems to decrease by the hour. Is this bad for cycling? No, not in my opinion. Discussing doping and getting facts in the open is good for cycling. It proves cycling has taken a position. WIll people continue to dope? Yes, but I believe the number of riders go down. As Vaughters said: "let's not give them the option." Lets level the playing field. 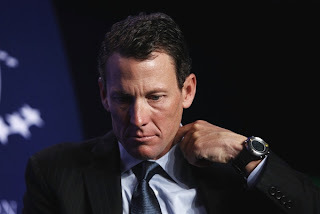 Will Lance Armstrong's life lie come out? I think so. He could have taken the initiative several times, he could have emerged with a different legacy than he will now. I hope this will be a lesson for everyone. Something for each and everyone to remember. The voice in ear - helpful?